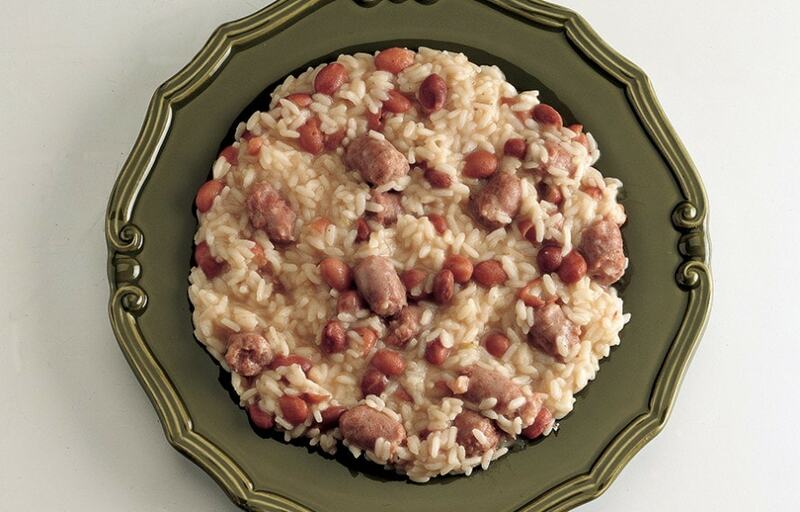 When you think of risotto variations, combining it with the tasteful Italian sausage might not be on your mental list. That’s a big mistake though, as risotto with Italian sausage is incredibly tasty, with a distinct flavor, thanks to the creaminess of the risotto and the spiciness of the sausage. Trust us on this–these two are a perfect match. And although we would recommend using Italian sausages in their normal size, if you don’t like the idea of having big chunks of meat in your risotto, you can use a food processor to mince the sausages and make them blend in, rather than stick out. It takes a bit longer to cook, but it’s worth every minute. Add the butter and olive oil to a medium skillet (cast iron works great). We use nonstick for convenience at the restaurant. When the pan is hot and the butter is melted, add the garlic and then add the rice. Stir the rice and garlic to coat with the oil and butter. Once completely coated, stirring for about a minute, add some of the stock until the rice is slightly covered. Continue to add the stock slowly as the stock is absorbed by the rice. Reduce to medium heat and stir occasionally to prevent sticking to skillet. Slowly reduce the amount of chicken stock that is added as you reach the desired tenderness, about 45 minutes. Once this magical point is reached, stir in the cheese.